The seniors of English 12 need your help! Are you a professional in one of the following fields – or know someone who is? Now in its second year, the Senior Capstone Project exists to engage seniors in meaningful research over an extended period of time in an area of their choosing. Something that fascinates them. Something that troubles them. A problem they want to solve. An issue about which they want to know more. They are three months into their research but are still only one-third of the way to becoming Capstone Cognoscenti, or Prairie seniors who have “superior knowledge and understanding of a particular field,” from the Latin cognoscentum for “knowing men”–and “knowing women.” I am happy to say that, already, each of them is able to speak with erudite enthusiasm about his or her chosen subject–and each knows so much more than I do, which means I get to learn from them! Eventually, you will, too! We have formed groups of like-minded researchers called Think Tanks. Students meet periodically with their peers in these Think Tanks, in class and virtually, to read each other’s drafts, offer feedback, and suggest resources. In the end, students will create their own websites to communicate and highlight their findings. And this year, some will be chosen to present their Capstones in a TED Talk-style evening. have a unique perspective on a particular issue and would be willing to share it virtually. Below is the list of Think Tanks and the specific subjects students are investigating. If you have anything to offer one or more of them, please take a minute to fill out this survey by the end of January. One of us will contact you to follow up. THE PSYCHOLOGISTS are exploring the teen brain, the neuroscience of memory, dementia, Asperger’s Syndrome, Adverse Childhood Experiences, child abuse, the secrets to becoming a dynamic speaker, and the wonder of neurotransmitters. THE EDUCATORS are exploring learning disabilities, differentiating instruction for different learners and interests, and the differences between Swiss, French, and American educational systems, as well as innovative educational models around the world. THE DOCTORS are exploring Doctors Without Borders, the ethics of brain surgery, and genetic engineering. THE SCIENTISTS are exploring electromagnetic fields and Millennium Prize Problems in mathematics. THE TECHIES are exploring future technologies, genetic engineering, cyber security, and gaming. THE SPACE CADETS are exploring space exploration, astrophysics, and the intersection of astrophysics and spirituality. THE PHILOSOPHERS are exploring leadership theories, moral theories, Buddhism in the 21st century, and the synchronicity of mind, body, and spirit. THE ENVIRONMENTALISTS are exploring the human impact on the environment, sustainable energy, endangered species, veganism, wilderness therapy and outdoor education, urban farming, the obesity epidemic, and environmental activism in the 21st century. THE ATHLETES are exploring physical training and overtraining, sports psychology, and the nature vs. nurture debate regarding athleticism. THE FAMILIALS are exploring the adoption system, the foster care system, and parenting styles. THE ANTHROPOLOGISTS are exploring a smorgasbord of human stories: the news media, social media, and the history of the “selfie”; world death rituals and witchcraft; heteronormativity and demythologizing the outlaws of the Old West; the United States’ approach to war veterans and historic and current models of leadership; and, in general, how anthropology is still relevant today. THE DIRECTORS are exploring film special effects and the loss (or enhancement) of storytelling and the secrets to writing a knock-out theatrical script. And finally, THE MONEYMAKERS are exploring the crowdfunding process and the best models for financial planning. Here, again, is the survey. Thank you in advance for completing it. 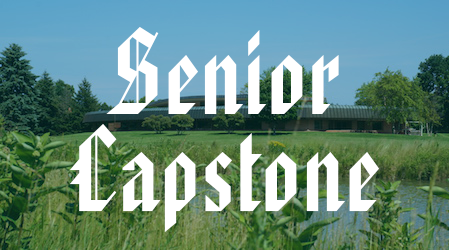 If you have any questions about the Senior Capstone–or ideas for future years–please feel free to contact me. Thank you! I await your responses! This entry was posted in All News, All School, Upper School by Communications Department. Bookmark the permalink.